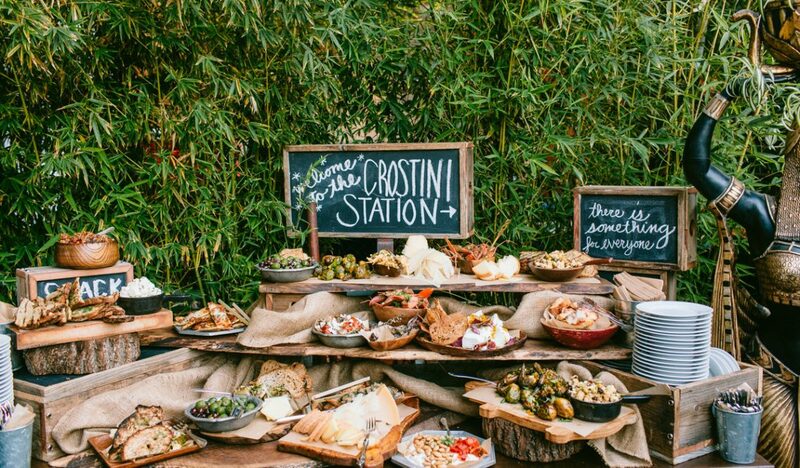 Forget the ceremony and the bride’s dress, what most guests are interested in when they attend a wedding is the food. If your memories of wedding fare includes mass-produced roast dinners or boring canapes you are not alone. Choosing a wedding menu that pleases everyone is a hard task, but if you know what the trends are then you can incorporate some of these ideas into your very own wedding. The trend of informal ‘pub-style’ meals such as bangers and mash or fish and chips is over. These days brides want a more stylish and Michelin-starred type of menu, with attentive servers and eye-catching food. Think beautiful linen, crystal glassware, gorgeous table settings and dressed-up guests. The rustic look is definitely out of style, so ditch the mason jars and the hay bales and instead opt for opulence. As for the actual menu, stay away from boring old staples such as dressed salmon or roast beef and give your guests a taste celebration, using fresh and local produce with several different courses, including a fish one with the occasional amuse-bouche in between. No more cupcake wedding cakes or naked cake constructions, and you can ditch the macaroon towers too. This years’ bride wants big and beautiful and with an emphasis on traditional. The taller and the more stylish and elegant the better. Bridal couples are now looking for a more sophisticated design with intricate detailing and the taller the better. The wedding cake should also be at the centre of attention, after the bride of course, and look imposing and grand as the guests enter your reception area. Mini versions of traditional recipes are a huge hit for wedding receptions. These tiny compressed dishes are served with cocktail forks and presented on tiny spoons and should resemble a mouthful or be placed on very small plates. This allows guests to have more variety when they eat, and not have to stick to a set menu or certain dishes. Couples are now much more adventurous when it comes to choosing their wedding menu, and will often bring in photographs of food they have enjoyed from their holidays and want chefs to now replicate these for their special day. Far from being the awkward lone diner that insists on something vegetarian or vegan, nowadays couples are opting for a total ban on meat or fish. Brides and grooms want to know exactly what is in their food and will often have few meat-free days for health reasons. This trend is being reflected in wedding menus. Chefs and restaurants are steering away from the traditional vegan option of a bland pasta bake and delivering exciting vegan foods that not only taste delicious but use exciting and unusual ingredients too. Guests now want to be a part of the cooking process and want a more personalised experience when it comes to food. Think cooking stations where guests can pick out individual ingredients for the chefs to cook, or even cocktail bars where you can choose what you want to drink and have it specially made up. Other trends include huge centrepieces that contain edible salad leaves where guests then go and cut the herbs and leaves that they want in their starters.